I get inspired by the oddest things. Sometimes a geeky TV show or something said in passing or even music will get that creativity flowing. This pattern was inspired by music; more specifically the song ‘Luck be a Lady’ crooned by Frank Sinatra. So let me introduce you to Lady Luck. Lady Luck features all four suites of a classic deck of cards on a full-size lace shawl. 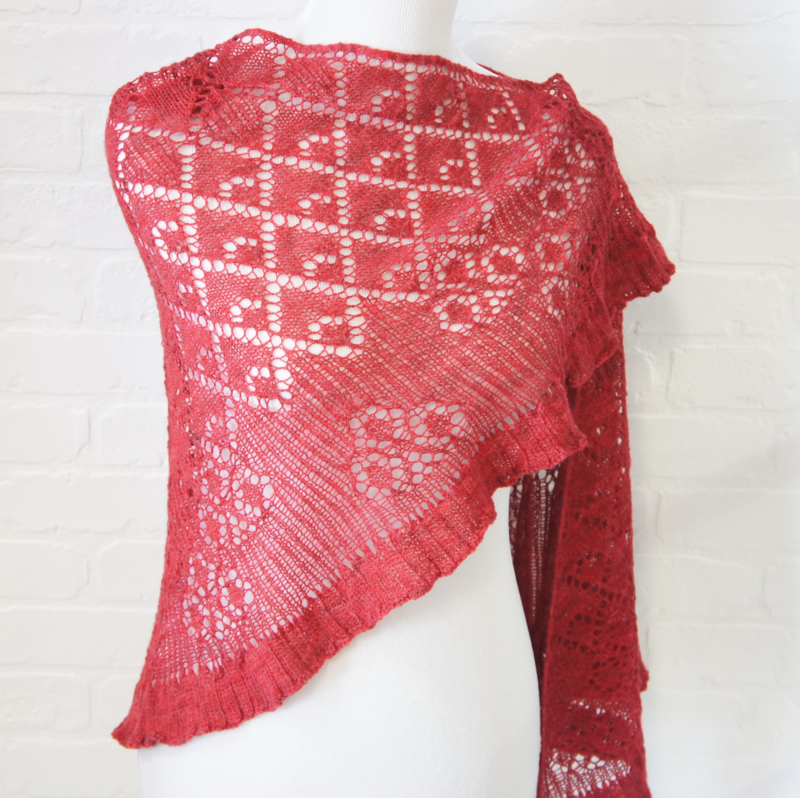 I played with texture in this shawl by adding reversed stockinette and ribbing in the lace to accent the shapes.The lace on the wings transitions gracefully from Hearts to Diamonds to Spades and finally to Clubs. 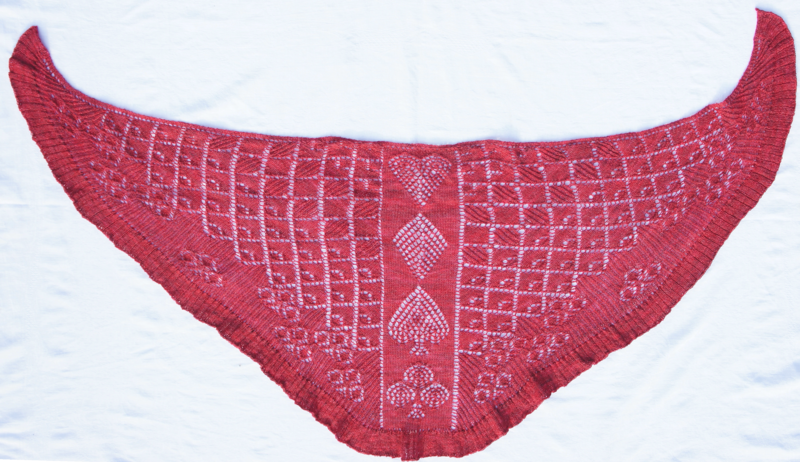 Designed with Faroese shaping, this shawl has large card suite motifs going down the spine. The whole beautiful shawl is finished in a simple ribbing. Lady Luck needs a yarn with a nice drape. I used TreasureGoddess‘ Treasured Bamboo in her Captain Blood colorway on one of my samples. Her Treasured Silk in Captain Blood worked up just as lovely in another. My testers informed me to warn future knitters that Lady Luck is not for the faint of heart nor the novice knitter. So knitters beware. Luck isn’t always a lady or Ole Blue Eyes wouldn’t be trying to convince her to behave. This pattern has 10 full-color pages and is completely charted. If you want to take Lady Luck out for a spin, you can pick her up in my Ravelry store or If you happen to seen TreasureGoddess at a festival she will have Lady Luck available in her booth as well. Tags: charts, pattern, patterns, treasuregoddess. Bookmark the permalink.